The ambiguous sculptures of Melvin Edwards and Rachel Harrison. Melvin Edwards is one of those artists who keep getting noticed for having been overlooked. Even back in the 1980s, when Edwards was in his 50s, he was already going through the “Congratulations on being discovered… again!” stage. Here in New York, he’s been a regular at museums and nonprofit spaces, starting with a show at the Whitney Museum as far back as 1970, but it took him until 1990 to find a gallery; since 2010, he’s been showing regularly with Alexander Gray Associates, which recently presented his newest work under the title “In Oklahoma” (many of the pieces having been made on a residency there). In the last few years, he’s gained an international audience, with one-person exhibitions in London, Paris, and Berlin, not to mention his participation in the 2015 Venice Biennale; later this summer, his work will be included in an important exhibition at the Tate Modern in London, “Soul of a Nation: Art in the Age of Black Power.” Maybe this time, the rediscovery will be for good. Given the force and inventiveness of Edwards’s work, it is hard to believe that racism wasn’t part of the reason it took the gallery world so long to give the sculptor his due. But it’s also true that he worked at a tangent to the dominant sculptural trends of his time. Many of his contemporaries were convinced that the mainstream of American sculpture passed through the minimalism of Donald Judd and Carl Andre, with its simple, additive rectilinear forms, to the disorderly “anti-form” works of Robert Morris and Robert Smithson, in which—as Morris put it—“random piling, loose stacking, hanging, give passing form to the material. Chance is accepted and indeterminacy is implied.” By such criteria, Edwards’s welded-steel sculptures, upholding the modernist tradition inaugurated by Picasso and Julio González in the 1920s and continuing through David Smith in the ’50s, might have seemed backward-looking—too monumental, too rhetorical, too humanistic. In retrospect, it’s clear that this self–defined mainstream was far too narrow. One can’t help but notice that, brilliant as Andre’s innovations were, he was never able to develop them—his art became mired in repetition—while Morris found a way forward in sheer eclecticism, veering wildly between neo-expressionist bombast and conceptual enigmas. Edwards, by contrast, has proceeded with great equanimity and concentration to keep unfolding the unexpected consequences of the work he began more than 50 years ago. The most obvious continuity within Edwards’s oeuvre has been his recurrent production of a series of small, wall-based sculptures that he calls “Lynch Fragments.” They first appeared in 1963, and he’s made them intermittently ever since, with several new examples in the recent exhibition at Alexander Gray. 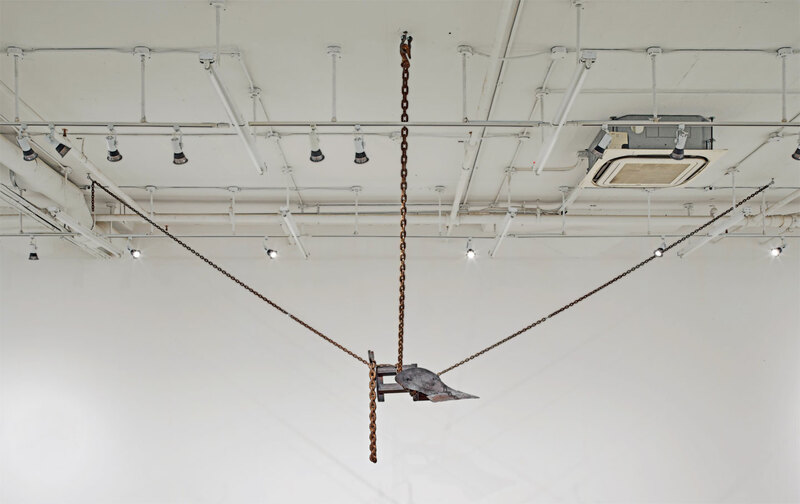 In these pieces, Edwards puts the accent on the weight and density of his materials—all sorts of found metal objects, including tools, machine parts, and, perhaps most notably, lengths of chain. Given the series’ title, it’s not surprising that these have often been seen to “evoke the manual labor associated with slavery and oppression”—an analysis that might reflect the particular narrowness of our own mainstream. In the recent exhibition, the Lynch Fragment For Miyashiro (2017)—named for an artist friend of Edwards’s who died last year—incorporates, along with the usual chain links, a wrench, a horseshoe, and a padlock, among other things less identifiable to me. The sculpture’s scale and rough symmetry just might make you want to find a metaphor for a human head in it, but the work seems neither to demand nor rebuff any particular narrative or figurative connotations. And anyway, to my eye, the associative connotations, though inexpungible, remain secondary. Instead, the artist’s fascination with the formal experience of art seems paramount—for instance, how to evoke feelings of linear movement in three dimensions, or how to give monumental force to a fairly small object. As I looked at the piece, I became more and more involved in and aware of my activity of perception. And I came to realize that it is my vision, as it has been drawn into the complex interrelations of the positive and negative, open and closed parts of the work, that created the sculpture’s scale and discovered the largeness and seriousness of purpose that justify the historical freight evoked by the series’ title. Also on view was ARK-LA-TEX OK (2016), a suite of four Lynch Fragments: three mounted in a row along one wall, the fourth installed kitty-corner to them, with each piece in the trio connected to the final piece by a length of barbed wire. The three curved but spiky lines form a rhythmic sequence that both calls attention to the corner and keeps the viewer out of it. The wires discourage trespass while demanding that you look at them as, simply, lines, like roughly drawn marks on paper that conjure an imaginary space. The real corner, distanced, becomes an idea about corners. Two Is One (2016) is a pair of Lynch Fragments set similarly on adjacent walls, but with a chain—rather than the visually and materially lighter, though more immediately threatening, barbed wire of ARK-LA-TEX OK—hanging across the corner between them. The gallery offered a commentary pointing out that this “contrasts the soft curve of chain and angled corner of the room,” which is true enough, but just as important to my mind was the contrast between the fluidity of the chain’s arc (which, thanks to the unfixed connection between its links, responds to the pull of gravity) and the fixed relations of the welded, mostly rectilinear forms that make up the two wall-bound constructions, which have been given a stable form that resists gravity. Though Edwards has worked on every scale over the years, “In Oklahoma” consisted of relatively small works, but his use of wires or chains as linear elements can make a small object occupy a large space. Agricole (2016) is a dramatic piece that feels much bigger than it really is. Its most prominent element is a plowhead arranged to look something like the visor of a military helmet. It hangs from the ceiling by three taut chains; a fourth chain hangs in a loop from the object itself. One feels the distinction between the chain that hangs loose, that exists as sheer visual gesture, and the chain used functionally, which works under tension. Both are necessary to Edwards’s art, but it is the ostensibly supportive lines occupying the space just above one’s head that give the work its expansive scale. Next door to the Alexander Gray gallery, Greene Naftali was showing works by Rachel Harrison, a sculptor some 30 years younger than Edwards. Unlike Edwards, Harrison hasn’t had to wait to be discovered and rediscovered—she’s been acclaimed pretty much since she started showing in the mid- to late 1990s. Like Edwards, Harrison enjoys playing with the ambiguities of form and reference, using concatenations of fragments that flirt with meaning while avoiding the declarative mode. I had to look up the exhibition’s title, “Prasine.” On Wiktionary, I found it defined as “A green gem; an emerald” and “A type of green pigment,” with the following etymology: “From a combination of Anglo-Norman prame, Middle French prame (from Late Latin prasinus) and Middle French prasine (from Late Latin prasinum), both ultimately from Latin prasinus (‘leek-green’)….” Come to think of it, there was a good bit of green spread throughout the show, though none of it put me in mind of a leek or anything else I’d want to eat. There were light-green packing peanuts and the darker-green plastic bristles of a broom, for instance, two of the many elements in Winged Victory (2017). The greens are nicely set off by a pink parachute cord at about calf level, which, not unlike Edwards’s barbed wire or chains, secured the assemblage to a metal stanchion way on the other side of the gallery. (At the opening, it took two gallery assistants on constant watch to keep guests from tripping over this cord; I wondered if they were actually part of the piece, but on my second visit they were gone, replaced by a warning note on the door.) There was also the bright-green dolly (or, to be more specific, the Nu-Wave drywall cart, as the gallery checklist tells me) in Bear Ears (2017)—the title refers to a pair of mesas that give their name to an area in Utah that was declared a national monument by President Obama in the waning days of his administration, an action his successor is reconsidering. The cart serves as a sort of base for a massive, rather amorphous boulder-like object (I think this is the wood, chicken wire, polystyrene, cardboard, burlap, and cement cited in the same checklist) that’s mostly painted purple, with some passages of a similar green. A soccer ball sits atop this lumpy mass, which also sports, like a single earring, a little USB flash drive plugged into it; the flash drive contains—-again according to that indispensable checklist—38 films by Harun Farocki, the late German experimental filmmaker. If this work were mine to do with as I pleased, I’d be tempted to remove the USB stick and download its contents to my laptop, thereby verifying that Harrison’s sculpture did indeed harbor these examples of a “self-reflexive, cinematic Cubism in which the medium itself, as a vehicle of truth, is subject to radical doubt,” to quote Ken Johnson in The New York Times. But I admit to being glad that I was unable to assure myself of the checklist’s accuracy; the penumbra of uncertainty left around the work fits in with my sense of what makes Johnson’s description equally applicable to Harrison’s work (as long as you take “cinematic” as metaphorical in her case). Like Edwards, Harrison puts found things we can recognize together with materials that have been manipulated in such a way that their original form is lost. And those found objects—-Edwards’s hammers and plows, chains and horseshoes; Harrison’s handcarts and USB drives, stanchions and packing materials—retain all their day-to-day associations even as their juxtapositions resist any coherent statement or story. These sculptures are not rebuses: A drywall trolley makes you think of construction work just as much as a plow head does of farming, but Harrison no more intends to make a moral point about the building trade than Edwards does about agriculture. In both cases, a question is raised about the relation between creating art and other, perhaps more obviously useful forms of work. But further thought might make you wonder whether the question is really a question; the only answer given lies in the artist’s quizzical consideration of things as they are. Such art starts with the work of simply wondering. But just as Edwards works with unattached pieces as well as attached ones—his Homage to Oba Ewaure II of Benin City, Nigeria (2016–17), consists of three separate steel elements lined up: two attached to the wall, the third a ladder leaning against it—the unfixed elements in Harrison’s pieces are nonetheless conceptually fixed. If someone were to take away that little box of push pins and the stained pages, they could immediately be replaced without much problem. In that sense, the apparent freedom and looseness of Harrison’s compositions are something of an illusion, just as the finally fixed forms of Edwards’s welded sculptures serve to obscure the fact that they are the product, in part, of highly spontaneous improvisations with whatever has come to hand, and might easily have turned out differently if the artist had approached them on a different day, in a different mood. So much for what I might call the sculptors’ material materials—that is, the physical objects they incorporate into their work. Because there are also, so to speak, immaterial materials: semantic and cultural objects, like the references to esteemed colleagues or forebears (Ronald Miyashiro, Harun Farocki) or to current or historical events (the controversy over the Bear Ears National Monument, the horror of lynching). Edwards’s Lynch Fragments don’t make me think about lynching by any other means but their titles; nor does Harrison’s Bear Ears contain any other allusion to the current land-use controversies out west pitting Native rights and environmental concerns against commercial development. At best, the titles’ relation to the works they represent is as loose as the links of a chain, or as tenuous as a sheaf of papers sitting on a window sill, liable to be blown away by a single strong breeze. Editor’s note: An earlier version of this article misstated the color of the parachute cord in Rachel Harrison’s Winged Victory. It is pink, not bright red. The text has been corrected.